As a mom of 3 boys,I know first hand that most moms do not get enough sleep on a regular basis. I know a lot of my problem is my old mattress , I am ashamed to say my mattress is going on 14 yrs and has seen better days. 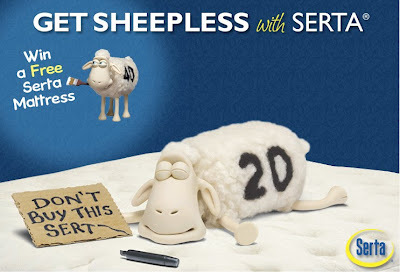 I want to tell you about a great contest going on right now, it is Get Sheepless with Serta. It is a contest to win a new mattress from Serta. YES, a new mattress.......ahhhh the thought of a good night sleep LOL. All you have to do is share a favorite “sheepless” tip about getting a good night’s sleep for a chance to win a Serta mattress with a retail value of up to $3,000. Visit the official Serta Facebook Page for details for entry rules and to get more info. You don’t have to be a fan to win or enter, but when you become part of the “Serta Flock” (aka, a fan) you’ll have access to exclusive giveaways and be among the first to hear about the latest promotions and events. This sounds fab! I need a new mattress!